Meanwhile, in the Region of Commander Stars, people’s ramp decks were getting something like plus one hundred card advantage every time they reached six mana. 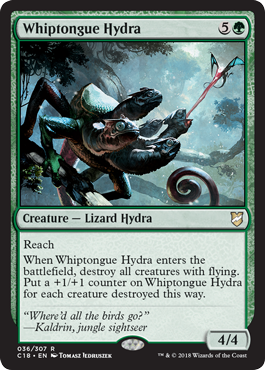 That might be an exaggeration – at a mostly-green table, you won’t always get a mass destruction effect out of Whiptongue Hydra, but it’s a strong answer to surprisingly many of the most popular creature types in Commander (Kaalia works with three of them). If he were in Modern, he’d even be worth considering there, as he could punish Faeries for being the deck they are and come down shockingly early in Tron and Valakut decks; and when you consider that people tend to invest a lot more mana per flying creature in Commander, and have an expectation of some kind of proportionate effect, he is in fact even better than that. Considering that green fares poorest against creatures that swoop, Whiptongue Hydra offers a reasonable way to lash back at avian perversions (and other winged menaces). While the initial body is fairly modest (6 mana for a 4/4 with reach is a bit low), it quickly pays for itself if you manage to pop even a couple of flying creatures when it comes into play. Of course, it scales better if you have more opponents and more winged monstrosities, but sometimes being able to kill just a specific flying creature is worth it.